Modern society has forgotten about Traditional Rites of Passage & Initiations. Strong masculine leadership & guidance from mentors are no where to be found. As a result, men are lost & lacking purpose. Suffering from anxiety, depression & loneliness. Our Ayahuasca Immersions in South America are an answer to what men have been waiting for. We create an environment where a band of brothers can come together & redefine what it is to be a man in today’s ever-evolving world. Our mission is to help men heal their emotional world, discover their purpose & create a life they are proud to live. Escape from an overstimulating world. 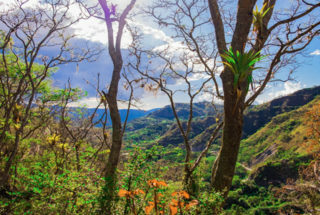 Relax in breathtaking views of the Sacred Valleys. Hike in pristine nature. Take a swim in the creek. Or just watch the stars at night. 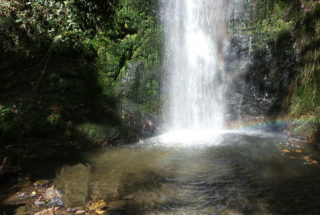 Authentic Ayahuasca & San Pedro ceremonies help remove any physical & mental blockages. Be part of a tribe of powerful men who are the same path to self-mastery & transformation. “For the 1st time I felt a sense of masculinity & confidence. Extremely powerful & transformational. I had 2 breakthroughs - it was intense. I was screaming and felt the scream of a real man, facing his demons." "Chris is good at drawing out your intentions, your purpose, your pain and giving you ways to confront it, open up, move past it and grow from it. I hadn’t felt this sort of release of emotions in years. It was really powerful & healing." "Chris provides in-depth coaching sessions that dig deep into all of your emotional baggage and helps you work through them. I would recommend his services to anybody looking to break through limiting beliefs, overcome past trauma and to learn tools to improve their lives." "I can wholeheartedly recommend the retreat and Chris as a coach. He's personable, sociable, caring, fun and able to help with all things brought up. Provided a lot of guidance and time as it was my first retreat. I will definitely work with him again in the future!" 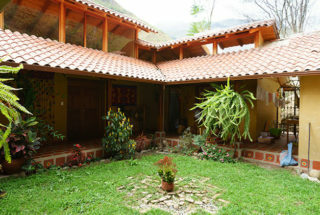 The private retreat is located on Ecuador’s southern valley region in Vilcabamba. 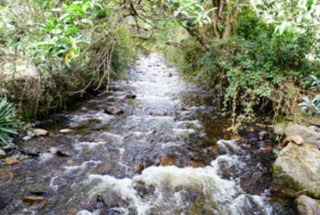 It’s known for its pristine mountains lined with trees and hikes, waterfalls and a clear view of the milky way at night. The 5 bedroom mountainside escape features a private running stream to lull you to sleep or swim in and offers panoramic views of the mountains towering in the background. 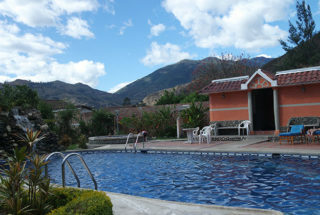 The large outdoor areas, private land and generous spaces throughout make this a hidden gem in Vilcabamba. 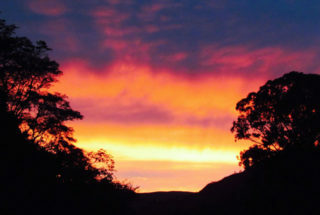 Sit under the stars with a crackling fire and connect deeply with other awakened men, soul-seekers and leaders. Why The Hero’s Journey Ecuador? Christopher left a successful Wall St. career after suffering a collapsed lung due to a chaotic and stressful lifestyle. He then moved to Thailand to pursue his dream of fighting Muay Thai and studying meditation. In 2014 he took his first trip to Peru to drink medicine with Shipibo & Andean traditions. It lead to deep insights about himself, healing past wounds – and ultimately helped him to find his purpose in life – helping other men who are facing the same problems he had to overcome. He’s dedicated his path to coaching men full-time while living in Bali and Thailand. Christopher has a unique background with an MBA in Finance & Marketing, leading entrepreneurial incubators and retreats in Bali, as well as creating traditional rites of passages and initiating men. 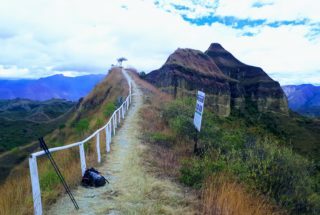 In the first year of launching the Hero’s Journey Experience in 2018, he lead 3-retreats in Ecuador. His openness and laid-back vibe allows his clients to feel relaxed, supported and understood – while also creating a safe and powerful crucible for deep transformation in their lives. Santiago comes from a long tradition of sacred indigenous teachings tracing back to the Cofan, Huaorani, Secoya and Kichwa tribes who he has lived among. Born in 1966, a native to Ecuador, Santiago found himself on the shamanic path at age 26 by working with sacred plants and the healing traditions of the Andes that extend down from Ecuador to Peru. Well known throughout Ecuador and the Americas as a highly respected Shaman and a gifted healer. He is also humble, deeply compassionate, wise beyond his years and carries a deep and powerful intention to heal with the spirit of San Pedro. As a guardian and keeper of one of the last San Pedro forests here in southern Ecuador, Santiago works with the sacred tools of his ancestors that have been passed down for generations. This allows you to re-connect with the subtle energies of spirit, so you can heal on all levels and start to transform your life. Jorge is 42 years old and he has been practicing shamanism for 12 years. He learned to lead Ayahuasca ceremonies from his father Jorge Medina. He is related to the Shuar tribe from Ecuadorian Amazonia and Cofan and Siona tribes from Bajo Putumayo in Colombia. He was blessed by FSI (Sacred Fire of Itzachilatlan) – Ecuador to share the medicine under the design of two tobaccos and to carry out purifying sweat lodges. Jorge has completed his 4-year vision quest long ago, and he is a 4-year sun dancer. 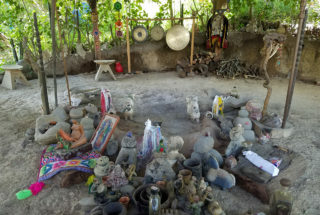 He has guided many people to prepare themselves so they can keep on the path of freedom and knowledge – so they can attend vision quest at every altar in Ecuador. I started along this path, on a school trip to the Pachacamac Temple in Lima, Peru, when I was 7 years old. My childhood and teenage years were deeply marked by the painful internal armed conflict. When I was 20 I embarked on a one way trip to Mexico, where I reconnected to my heart’s ancestry. I then became a mother of four. And I must say, this became my most sacred spiritual initiation, the most challenging and the most sublime. I am initiated on the path of Bhakti, of the Vedas. I am also initiated as a Pampamisayoc within the Andean Q’ero cosmovision. I haven’t always embraced my mission. On the contrary, I struggled with myself, during extended periods of darkness, where I denied my own aptitudes with great endeavor. Without the support of two of my teachers and of my Godmothers, I would not have traversed through the quagmire of my confusion. I bestow upon them the utmost gratitude. And this radiant dream has manifested with the sole purpose of being shared. I consider myself an apprentice along this path which I honor, and it keeps me humble. 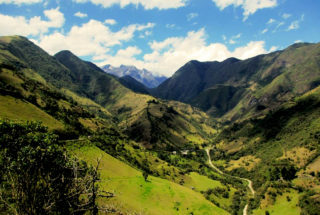 I live in the Sacred Valley of Vilcabamba, Ecuador for 18 years. I have nested with the shaman, alongside the river which is where are the magic occurs. 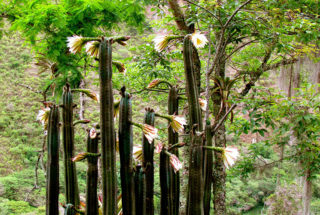 All within a forest of native San Pedros and Huilcos, which are sacred plants of power. Honoring my truth, this is as honest as I can be regarding my path and my journey. "Extremely powerful & transformational. I had 2 breakthroughs - it was intense. I was screaming and felt the scream of a real man, facing his demons. For the 1st time I felt a sense of masculinity & confidence." “The retreat in Ecuador was simply– powerful. I met Chris once in Thailand for a week a couple years back and he reached out to me to participate in his first ever ayahuasca retreat in Ecuador. I can absolutely say the retreat changed my life. Chris was great to work with. He provided the care and support to prep me for my vision quest. His coaching discovery sessions helped me identify and work through issues I faced in my life and prep me for the retreat. I had a friend that bought his ticket to the retreat right after a 2 hour discovery session with Chris! I went to this retreat with some well-thought out intentions I wanted to work through. I had a really intense ceremony and after the ceremony I felt “reborn”. Free from all my past traumas. I now have this grounded peacefulness inside that I am enjoying. I should also mention, I have not touched alcohol since the retreat (close to 4 months now). Just because I want to take care of myself. I understand why they call it plant ‘medicine’ now. The experience also gave me some direction in life in regards to business and I have been taking boxing classes every day after work to release some of my stored masculine energy. “I went to the June 2018 8-day men’s retreat with Chris. It was intense, but very powerful. The medicine work was challenging but rewarding as I expected. It really put me on a better path. Overall I think the retreat was well organized. I tried to not come with too many expectations, but it definitely lived up to the expectations I had. The experience was difficult in all areas. The hikes and the sweat lodge pushed me to my limits and beyond. Helping me realize I can do more than I think physically. Mentally it was even more difficult, since I am very sensitive, so my mind was constantly racing. But I feel like I can deal with those thoughts better now. “Spiritually” I felt like I kept walking the same trail which Ayahuasca showed me two years ago. The place is beautiful and the rooms/other areas were clean and comfortable. The food was amazing!!! My favorite thing was the sweat lodge. But the whole thing was amazing, the hikes, dinners, workshops ect. Also relaxing at the sauna between ceremonies was a nice experience. Working with Chris was easy. He knows how to relate to your problems and gives good tools on how to improve your life in those areas. I feel like the coaching during and before the retreat was helpful as well. The workshops were helpful and Chris gave good tools to use after the retreat. The meditations and morning routine were my favorite. I felt like the books and the info given before was useful, and made me see the work I had to do in more easily understandable way. Also they put me in a right mindset for the retreat. Before the retreat negative emotions and thoughts controlled my life. Now my thinking has changed to more positive and it is easier for me to see my remaining negative thought patters. I feel more comfortable with myself. It is easier for me to do the things I want and to express myself.